It can be so hard to stay positive as an immigration attorney in times like these. Every day, we face new assaults from the president, the attorney general, the Department of Homeland Security, and the Department of Justice. This week, we learned that the attorney general is attempting to circumvent due process by telling immigration judges to reject asylum petitions without a full hearing if, upon initial review, they appear to be fraudulent or unlikely to succeed. People come here fleeing their countries, looking for safety, and the government is doing everything in its power to deny them protection. It is truly horrifying. But that is not why I am writing today. There is so much negativity that we face every day; it is unavoidable in a political climate like the one we are currently facing. Today, though, I would like to share some asylum grants that we earned this week. 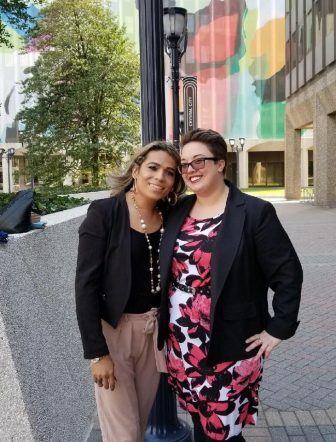 These two cases are not only big wins for America’s newest asylees, but for justice, fairness, and the belief that America really is a country where people can be safe and free. It is not easy to obtain asylum here in the United States. Although some have claimed that “dirty immigration lawyers” have “magic words” that we feed to asylum seekers, it is truly not that simple. In order to obtain asylum here, an immigrant must request protection within one year of arrival. They must show that they have suffered past persecution (or have a well-founded fear of persecution) in their country of origin. They must have been persecuted by the government or by an entity that the government is unable or unwilling to control. And they must prove that the persecution occurred due to their race, religion, national origin, political opinion, or membership in a particular social group. Finally, they must show that they merit asylum as a matter of discretion. A person does not just say, “I’d like asylum, please,” and then get the green light to stay in the country. The process is arduous, lengthy, and full of legal complexities. Unsurprisingly, immigrants who are not represented by an attorney have a 90% chance that their asylum application will be denied. Fortunately, that was not the case for two of our clients this week. On Tuesday, we had a huge win for a young man from El Salvador who faces certain death at the hands of the MS-13 gang. He had made the mistake of joining the gang when he was fourteen years old, as a child who had been abused and abandoned and who was in search of a family. He turned to the gang for that sense of belonging, but quickly realized the horrors of gang life. He renounced the gang in 2005 and subsequently dedicated his life to gang prevention work. For the last thirteen years, he has worked with law enforcement, community leaders, reporters, educators, parents, and at-risk youth to show them the dangers of gangs. He is now married and settled down. He has four US citizen children. He works six days a week at a local construction company. He is a model member of our community. One would think that asylum would be easy for him to obtain, given that MS-13 will almost certainly murder him if he ever steps foot in El Salvador. But of course, it is not that easy. For a long time, the case law simply was not on his side. No one would even consider giving asylum to a former gang member. Fortunately, the tide turned in 2014, with the ruling in a case called Martinez v. Holder (in part thanks to our own Ava Benach). In that case, the Fourth Circuit Court of Appeals found that former gang members qualified as a particular social group for the sake of asylum. Now, the only thing standing in the way for our client was showing that he deserved asylum in the exercise of discretion. If any former gang member could ever get asylum, it was him. The gang prevention work he has done over the last decade meant putting his own life at risk in an effort to keep our children safe. No one could possibly merit discretion more than this young man. And I am so pleased to announce that on Tuesday, after thirteen years of fighting this case, he was granted asylum in this country. Then, on Friday, I had the pleasure of representing one of our clients from our partnership with Whitman-Walker Health. She is a transgender woman and LGBT activist from El Salvador. She suffered horrific abuse there due to her gender identity, including from her own family, the police, and the gangs. She nearly died of appendicitis when hospital staff refused to treat her because she was trans. The police once beat her so severely that they fractured her hip. Finally, gang members attempted to assassinate her because of the work she did on behalf of other trans folks and the LGBT community in El Salvador. She fled the country and arrived in the United States in 2015. 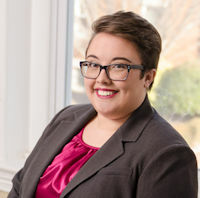 Now that she is safely here, she continues her trans advocacy work through Casa Ruby, a local organization that provides shelter for homeless members of the LGBT community. She is recently married and looking forward to her honeymoon with her new husband. 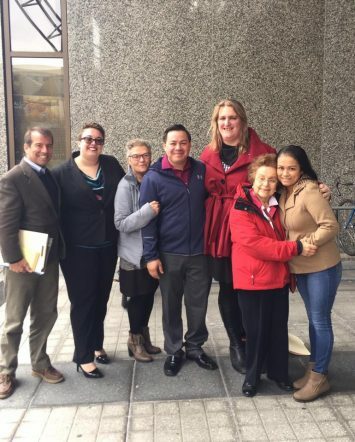 Our client HTG and her lawyer, Sarah Pitney, after her grant of asylum. Then the judge said something that had me tearing up. She spoke directly to our client, and she said, “I am going to grant your asylum. But first, I want you to know something. In this country, it does not matter what anyone thinks of you. All that matters here is what the law says. If you meet the requirements of our laws, no one can turn you away or deny you the ability to stay here. You do not have to beg me for anything. I know it was just a turn of phrase, but I want you to know that in this country, you will never have to beg for anything ever again.” I know that it does not seem like much, but to our client (and to me), it meant the world. I was so thrilled to send her off on her honeymoon as America’s newest asylee. Not all weeks bring the kinds of joy that I got to experience this week. We face a lot of darkness in the work that we do. These two clients have been beacons of hope, not just for me, but for other people who are seeking asylum in this country. We may have an administration that is trying to prevent people from receiving the protection of this nation, however, they will never be able to turn away the truly deserving. We will do everything in our power to bring light to those who need it most. As for me, I will take a little bit to savor this moment of joy, and then I will get back to work fighting the good fight.